This job processes the File system locations that are set in the GDPR File system settings. 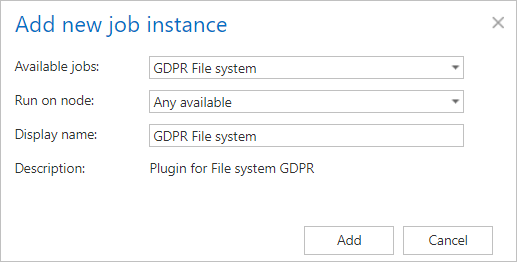 To create a new GDPR File system job, click on the + new, pick the job type from the dropdown list and enter the display name. Click on Add. In this step the running time(s) of the job must be selected. It is possible either to select a scheduler from the list or to create a new scheduler via create new… option from the dropdown list. For the GDPR jobs it is recommended to set a schedule, which will start the job every week. In this section it is possible to select the file types from which the job should/shouldn’t extract the content. It is also possible to specify custom file types. 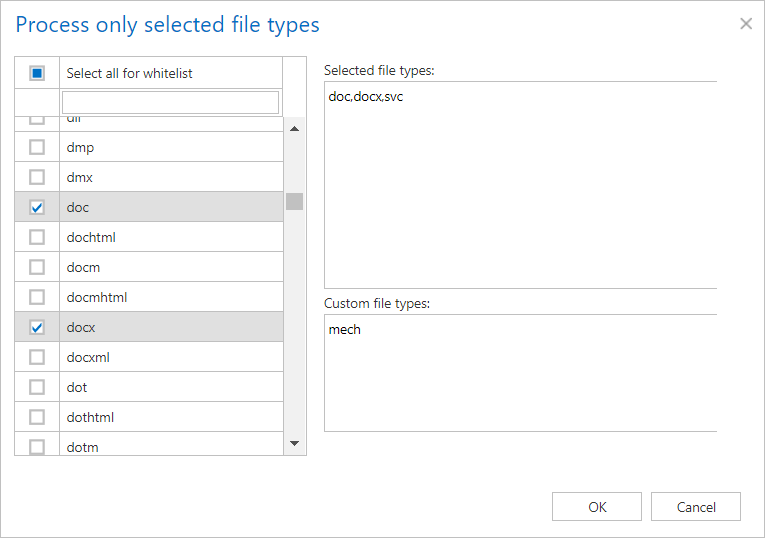 White listed file types: If this option is checked and the file types are filled in, only content of those types will be extracted. Any other file type’s content will not be extracted. 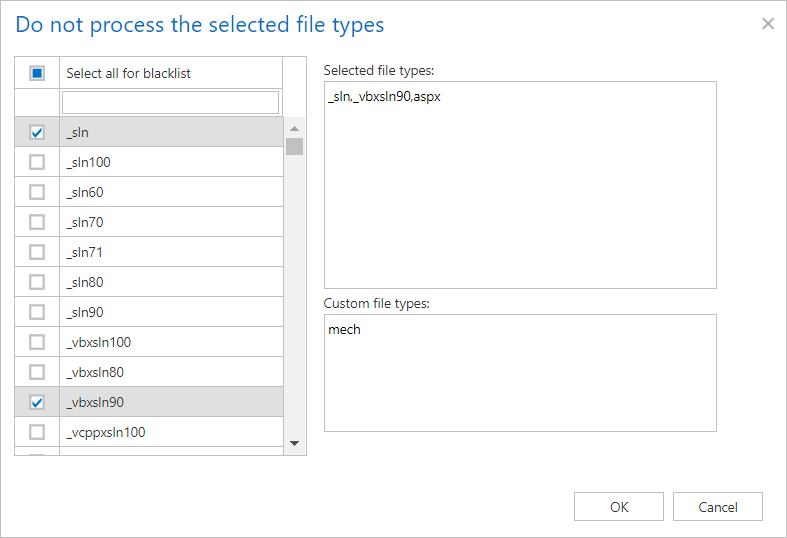 Black listed file types: If this option is checked and the file types are filled in, content of those types will not be extracted. Any other file type’s content will be extracted. This configuration enables the user to filter among items by 2 types of criteria: by age and size. It is possible to use more filters simultaneously. For filtering items according to any of these criteria, activate the filter button by checking the checkbox next to it, then click on the activated button. These filters work the same as Age filter and Size filter in File archive job. Select here the cases, in which you need to get notification emails from the GDPR File system job. It is possible to set here if you need such a notification email always/never, or if you need it only in case when an error/warning occurred during the job run. Into the Recipient list textbox insert the email address(es) of the person(s), who will get such notifications. Notifications should be used if the administrator does not use the monitoring feature. Set the value, which will determine how many items will be processed simultaneously by the GDPR File system job. The recommended value is “2”. File deletion: After a file is deleted from one of the specified root folders and the job is ran, the file is deleted from the database and from the index as well. Folder deletion: After a subfolder is deleted from one of the specified root folders and the job is ran, the folders and the files under that folder are deleted recursively from the database and from the index as well. File move: After a file has been moved between different folders and the GDPR File system job has been ran again, the file will disappear from its original location and show up under the new location. These information will also be updated in the database and index. Folder move: After a folder has been moved between different locations and the GDPR File system job has been ran again, the folder and the files will disappear from their original location and show up under the new location. These information will also be updated in the database and index. Root folder deletion: After a root folder is deleted from the File system settings configuration, the next time the job is started, it will delete all the root folder related data from the database and from the index as well. File modification: If a file has been modified since the last run of the job, then the job will update the file’s content and properties in the database and index as well.